Adding a new page to your WordPress website is very similar to adding a new post. 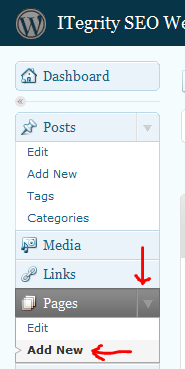 To add a new page, log in to the Admin area of WordPress and click on “Pages” in the left navigation. In the expanded “Pages” area in the navigation, click on “Add New”. Now you’re ready to begin adding a new page to your website. Once you’ve finished adding your page, a new link will be created on your WordPress website for your page. The location of where this link will appear within your website depends on the type of template you are using for your WordPress website. 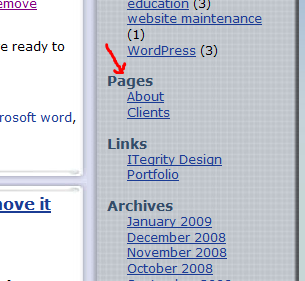 Many templates, including the default template for WordPress, display the page links in the sidebar of the page in a vertical navigation under the heading “Pages”. In other WordPress templates that use a top horizontal navigation, the page links will appear side by side in this area. When you create a new page, a link to that page will appear in the page navigation area of your website. 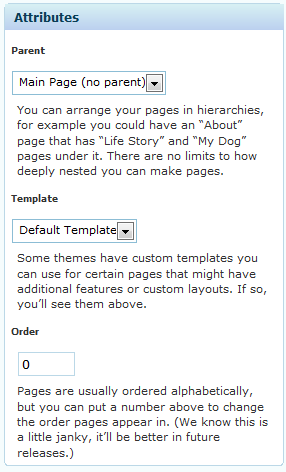 To get started writing your new page, choose a title for the page. The title will also be the way the link to the page appears in the navigation within your website. Try to keep the page title to one or two words. Long page link names aren’t user friendly and make it difficult for the user to quickly read and determine where they want to navigate to next. When possible, you’ll also want to keep the number of pages links in odd number groups of 3, 5 , or 7. Having an odd number of links in your navigation is good design because the human eye tends to look at the center object and the objects on the ends. This divides the objects (your page links) into pattern groupings that are logical for the human thought process. Keep your main page navigation links to 7 or less when possible. Having more than 7 main page links in your navigation is not advised because it becomes too cumbersome for a site visitor to locate the page where the information they are seeking is. Not to worry, if you need to have more than 7 pages, you can arrange your pages in a hierarchy with an unlimited number of pages listed under each main page link. You can also employ the use of a “drop down” menu to add addtional page links in your navigation. This requires installing and activating a special drop down menu WordPress pluggin such as the WP Multi-level Navigation Plugin. Choose 3, 5, or 7 main page categories and then add sub pages within each main page link (if you temporarily need to have an even number of link it’s OK). For example a sail charter company could have a main page link in the navigation titled “Charters” and when a visitor hovers over the “Charters” link a drop down menu appears with links to “Sunset Cruises”, “Whale Watching”, “Corporate Charter”, etc. After you’ve chosen your page title, you can begin to add content to the page in the text area below the formatting toolbar. You can either use the standard “Visual” text editor tools to format your text, images, and media or the “HTML” editor for individuals who feel more comfortable using HTML code (learn how to add an image to your page). Most WordPress installations are set to automatically save a draft of your work when writing a page or post, but it is a good idea to manually save your work once in a while, especially if you’ve been working on it for an extended period. 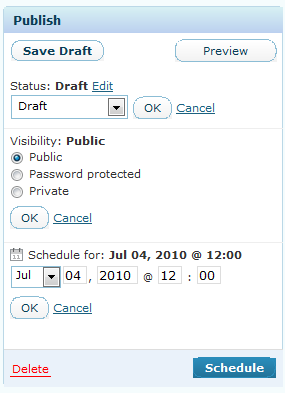 You’ll find the “Save Draft” button in the publish pane on the right side of the page. This is also important if you want to stop work and pick up again later. Once you’re finished creating your page, there are a few settings on the right side of the page in the “Attribute” pane that you need to consider. Parent: This where the drop down or hierarchical menu is set. If you want the page to be one of your main navigation links then you don’t need to change anything here. However, if you’d like your page to be nested under one of your main navigation page links, you can set which main page link or the “parent” page it will be nested under. Template: If you are using a custom WordPress template that has sub templates for different types of page layouts, you can choose which one to use here. For most standard WordPress sites you’ll never need to change this setting. Order: As you add page links to your navigation, WordPress will arrange the links alphabetically by default. This is not usually the best way to arrange your links. You can override this by specifying the page link order numerically starting with o or 1 for the first page link you want to appear and so on. At this point you are just about ready to publish your new page to your WordPress website. In the “Publish” pane above the “Attributes” pane, you’ll notice a few options. Status: This shows whether the page is currently live, or published to your website, still a draft, or pending review. Visibility: By clicking on the “edit” link, you’ll see a few options appear. Normally you’ll want to keep the visibility setting on “Public” so all visitors to your website have permission to view the page. However, you may occasionally want to password protect a page. Choosing this option will prompt you to create a unique password for your page. The page link will be visible in your website navigation, but when a visitor tries to view the page, they will be required to enter the password you’ve specified. This can be a useful feature to quickly protect a page, but for a more comprehensive website wide solution, WordPress plugins exist that present a better solution, such as Role Management for WordPress By Thomas Schneider. The last option is “Private”. Making a page private will hide your page from your website navigation unless you are logged in. You will also not be able to access it by search or by directly entering the page URL in your browser unless logged in. Publish: Not to be confused with the “Publish” button, the “Publish” setting directly below “Visibility”, controls when your page will be published to your website. If you leave this unchanged and click on the publish button, your page will be published immediately. There may be instances where you don’t want to publish your page right away, but at some time in the future. By changing the date and time, you can schedule WordPress to automatically publish your page to your website at any time of your choosing. Before you publish your page it’s a good idea to see how it will actually appear within your website after it’s published. Click on the “Preview” button in the “Publish” pane to see a preview of your page. After you’ve made any adjustments to your page and you’re ready to make it live on your website, click on the “Publish” button. If your page or any of the settings you chose aren’t appearing properly you can always edit the page as many times as you like and re-publish.